Chance Theater photos from 12/10/2011 have been added to the photo's section. - Recent Press: Sanctuary is featured on Paul Di'Anno's bonus DVD from his album, The Living Dead, see our My Space page for the clip. *Tickets are onsale now for Sanctuary, live at Starland Ballroom, 570 Jernee Mill Road Sayreville New Jersey Saturday July 13th. This event marks the 20th anniversary of the Titans of Tribute concert series, and will be a full stage show with Eddie and various Iron Maiden classic hits as per Iron Maiden's Legacy of the Beast tour. Also performing will be Into The Void - Black Sabbath Tribute and Appetite for Destruction - The Ultimate Guns n Roses Experience. Tickets are $15.00 in advance $18.00 day of show, you must be 21 and older to drink. For more info contact Starland Ballroom at (732) 238-5500. Scream for me New Jersey, Live at the Brighton Bar 121 Brighton Avenue Longbranch New Jersey Saturday March 16th, Sanctuary will be sharing the stage with Gutter Cats Alice Copper - Tribute. This event will be a full stage show with up to 2 hours of various Iron Maiden classic hits. Doors open at 6pm, show starts at 7pm, you must be 21 and older for admission. For more information and directions to the show, contact the Brighton Bar at (732) 229-9676. 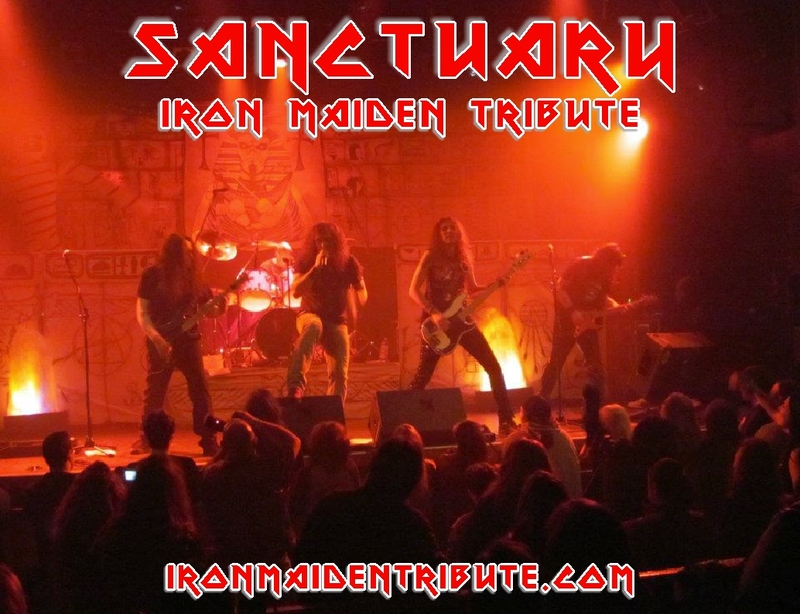 What makes Sanctuary New York's Ultimate Iron Maiden Tribute? for smaller scale local shows, the band uses various custom back drops & banners. To date, no local Iron Maiden tribute band offers these fan favorite acts, and no true Iron Maiden fan has been disappointed after seeing us perform live. Visit the showdates and prior gigs pages, and see for yourself that Sanctuary performs regularly, at some of the local areas most popular venues.